Container ship El Faro apparently sinks during Joaquin with 33 aboard. Coast Guard officials speaking on Monday in Miami about the apparent sinking of the container ship El Faro in the Caribbean. 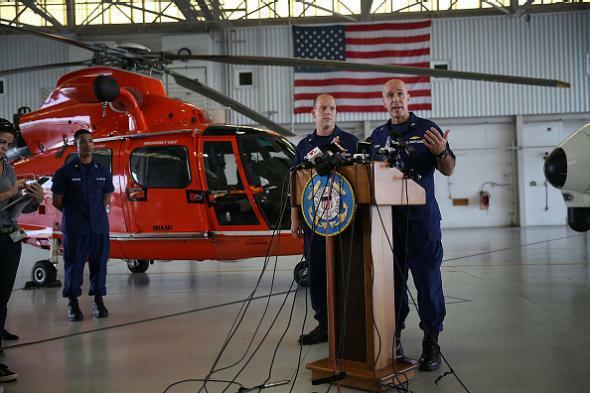 The U.S. Coast Guard is no longer searching for the missing cargo ship El Faro but focusing on any signs of survivors. Searchers have found life rafts and survival suits, including one survival suit with human remains, Coast Guard Capt. Mark Fedor said Monday. The body inside the survival suit was unidentifiable, he said. El Faro was based in Jacksonville, Florida, and was traveling to San Juan, Puerto Rico, when it was lost. * Its last known position was 35 nautical miles northeast of the Bahamas. Per the Associated Press, El Faro’s crew “reported that the ship had lost power, had taken on water and was listing 15 degrees but that the situation was ‘manageable’ ” in its last communication Thursday morning. Correction, Oct. 7, 2015: This post originally misstated the El Faro’s destination.